1 /CS1 This is the chip select signal. 2 /RES When /RES is set to “L”, the register settings are initialized (cleared). 3 A0 It determines whether the data bits are data or command. 4 RW-/WR • When connected to 8080 series MPU, this pin is treated as the “/WR” signal of the 8080 MPU and is LOW-active. 5 E-/RD • When connected to 8080 series MPU, this pin is treated as the “/RD” signal of the 8080 MPU and is LOW-active. 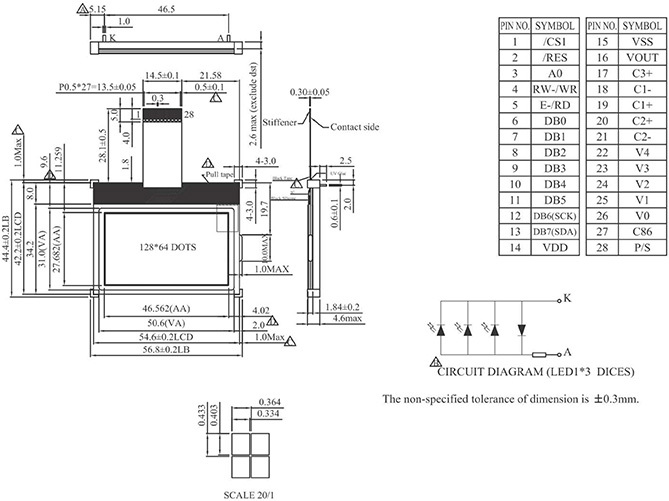 6 DB0 When using 8-bit parallel interface: (6800 or 8080 mode) 8-bit bi-directional data bus. Connect to the data bus of 8-bit microprocessor. When CS1B and CS2 are non-active (CS1B=“H” & CS2=”L”), D[7:0] pins are high impedance. D[5:0] are not used and should connect to “H” by VDD. 16 VOUT DC/DC voltage converter. 17 C3+ DC/DC voltage converter. Connect a capacitor between this terminal and the CAP1N terminal. 18 C1- DC/DC voltage converter. Connect a capacitor between this terminal and the CAP1P terminal. 20 C2+ DC/DC voltage converter. Connect a capacitor between this terminal and the CAP2N terminal. 21 C2- DC/DC voltage converter. Connect a capacitor between this terminal and the CAP2P terminal. 22~26 V4~V0 This is a multi-level power supply for the liquid crystal drive. 27 C86 This is the MPU interface selection pin. 28 P/S This pin configures the interface to be parallel mode or serial mode. P/S = “H”: Parallel data input/output. When P/S = “L”, D0 to D5 must be fixed to “H”. The serial access mode does NOT support read operation.